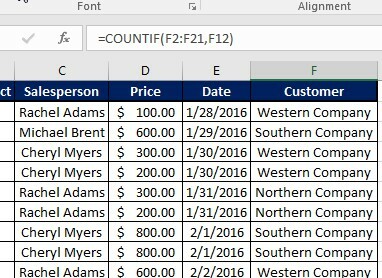 IF Statements in Excel are some of the most useful functions you can use. There are a variety of IF functions and each one can be used for a variety of purposes. Over the next few weeks, we will explore the various IF functions, their uses and how to create them. This week, we are focusing on the CountIF Function. As you can see, it just counted the total number of cells with data. But let’s say you wanted to count the total sales to a particular company. In this case, you could use the CountIF function to find the total sales to a company. The above examples are if the value you’re looking for is an Exact Match. You can also do greater or less than. Now in some cases you might want to it count equal to And less than (or greater than). In those cases, you will add the = sign after you enter the greater than (>) or less than (<) symbol. We here at Learn Excel Now hope you now feel comfortable using the CountIF Function. We will be brining you more IF statement tips over the next several weeks so stay tuned! Very simple and very helpful, thank you. The COUNT function does not count how many cells in a range have data; it counts the number of cells in a range that have numbers (pure numbers, functions, and formulas with numeric answers). The function COUNTA counts the number of cells in a range that have data of any kind; inother words, cells that are non-blank. These are really nice tips. I would take some classes, but I work for myself, and as a small business I just don’t have the money.